The RAPTOR PROTECTOR™ Platform is designed to provide the raptor an alternative to nesting on utility structures, where they are in danger of electrocution. The RAPTOR PROTECTOR Platform also eliminates many outages caused by the raptors and their young due to electrical short circuits and the fowling of insulators. 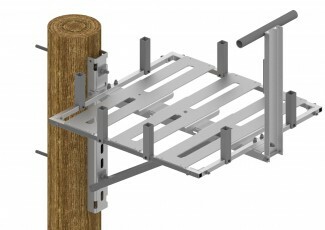 The platform can be easily installed in a pole-top or side of pole application. The preassembled and lightweight platform can aide the utility in wildlife management and protection for years without maintenance. Read more: Dominion Energy utilizes RAPTOR PROTECTOR Platform to protect wildlife and prevent outages.